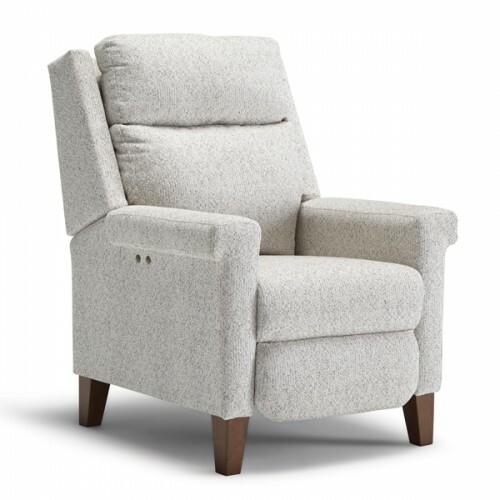 The Prima high leg reclining chair exudes elements of Mid-Century design while maintaining enough traditional features to fit in most décors. The straight lines in the profile, angled arms, and slightly pitched back will make this recliner the prima donna of your living room. If choosing power recline, the touch button sensors will allow you to effortlessly raise the foot extension as well as recline the back. Start and stop at any position that makes you comfortable. If non-power is your game, a simple push back on the arms will get you where you want to be. Choose from three different finish options to complement the nearly 700 fabric options available. Regardless of your choice, it will be custom made in one of the industry's fastest turnaround times by our Indiana craftsmen. A zipper in the back will allow you to have access to the high-loft cushioning fiber blend to customize your comfort level. The seat cushion features encased coil springs for long lasting comfort.